Beautiful sunny, spacious Bach. Views overlooking the popular beach where there is fishing, swimming and boating at your doorstep. 2 stories with a lift ideal for those that struggle with stairs. Upstairs has toilet, 2 brms, fully equipped kitchen, gas fire in lounge and balcony. Downstairs has shower, toilet, lg brm with 4 beds and a large rumpus that could hold another 2+ mattresses. With a boat ramp 100mtrs from the property and no restrictions to see what the sea is doing, it makes for a very easy fishing trip. Only a couple of Km's out and there are Snapper, Trevally, Dory, Kahawai and Kingfish a plenty.. Dont mind getting wet then there are Crayfish, Scallops, Kina and the famous Maketu Mussel. A short 5 min drive through private property over to Newdicks beach and you have acres of lovely golden sands and gentle waves, great for a splash or a chill. For the shop o holics you have Bayfair shopping center or Mt Maunganui's various arrays of shops a quick 20mins away. For the kids there is a playground next to the boat ramp, and at low tide there is rock pools to explore just around the corner past the cafe. There is a bus service the operates between Mt Maunganui, Maketu, Pukehina and Whakatane. Timetables can change so best to check first. Please take all your own rubbish with you. There are bags provided. Strictly no pets inside sorry. We absolutely loved our time in Maketu. The views from the home are incredible...the tide flows in and out from the estuary to the ocean right in front of the bach, which makes for waves you can surf, pools you can swim in and a nice little beach to hang out and have fires on. It’s even better than the pictures could possibly show! The house was perfect for 7 of us, but could have easily accommodated a few more with plenty of space. Wade & Mereheni were awesome hosts...we’re already looking forward to our next visit! Property was excellently advertised in a decent small NZ town. Cool little batch that had everything you need and is in a beautiful spot . 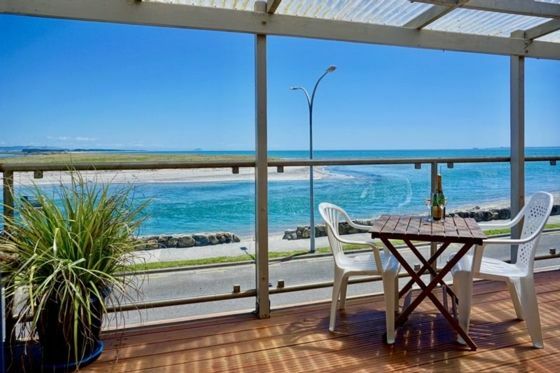 great location with a fantastic view of the beach, estuary and all the way to Mt.